Today is Kamehameha Day in Hawaii, honoring King Kamehameha I – sometimes called “The Great” – who unified the Hawaiian Islands and established the Kingdom of Hawaii in 1810. The year of his birth is unclear, but it was portended by a priest that a king would be born, destined to unite the Hawaiian Islands, when a great fire appeared in the sky. Halley’s Comet, which was visible from Hawaii, appeared in 1758, so the general conjecture is that he was born soon after its appearance. During his youth (and before) factions on the main island of Hawaii itself, and neighboring islands in the archipelago, were constantly at war for dominance, with succession to powerful positions constantly contested. Trying to give you a summary of all these contests and Kamehameha’s role in various battles would be much like trying to untangle a knotted kite string, (not to mention the insane difficulty of remembering all the long names filled with vowels and apostrophes), so I will simplify it all by saying that he rose to prominence when his first cousin became head of a powerful region on Hawaii in 1782. There was bitter rivalry between the two cousins, but with the support of five chiefs from the Kona region (four of whom were relatives, and one his teacher), Kamehameha defeated his cousin to take his place. As such he controlled the northern and western parts of the main island. In wars in 1790 and 1791 he defeated the remaining chiefs of the main island and became the king. Between 1795 and 1810 Kamehameha fought a series of naval and land battles against the other islands in the archipelago including Maui, Moloka?i, O?ahu, Kaua?i and Ni?ihau, the latter two proving stubbornly resistant. It took Kamehameha 14 years to wear down these two islands, requiring him to build up a massive army and navy to accomplish the talk. Having become king of the entire archipelago he took steps to ensure that on his death the kingdom would remain united. 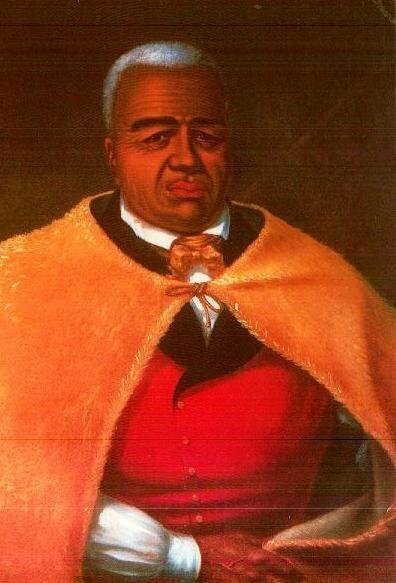 As king, Kamehameha (full name as king — Kalani Pai?ea Wohi o Kaleikini Keali?ikui Kamehameha o ?Iolani i Kaiwikapu kaui Ka Liholiho K?nui?kea), took several steps to ensure that the islands remained a united realm even after his death. He unified the legal system and he used the products he collected in taxes to promote trade with Europe and the United States. He did not allow non-Hawaiians to own land, which ensured the islands’ independence even while many of the other islands of the Pacific succumbed to the colonial powers. In fact, the Kingdom of Hawai?i that Kamehameha established retained its independence, except for a five-month British occupation in 1843, until it was annexed by the United States in 1898. It was this legacy that earned Kamehameha the epithet Napoleona o P?k?pika (“Napoleon of the Pacific”). Kamehameha is famous for instituting M?malahoe K?n?wai, the Law of the Splintered Paddle, which guaranteed the safety of all non-combatants during times of war. Although he ended human sacrifice, Kamehameha was a devout follower of the Hawaiian religion and Hawaiian traditions (such as Lua, a form of martial arts). He believed so strongly in his religion and culture that he would execute his subjects for breaches of the strict rules called kapu (known elsewhere in Polynesia as tapu, that is, taboo). Kamehameha Day, June 11, was first proclaimed by Kamehameha V in 1871 as a day to honor Kamehameha I who was his grandfather. Late 19th century celebrations of Kamehameha Day featured carnivals and fairs, foot races, horse races and velocipede races. These days the festival is marked most especially by floral parades, and by draping various statues of Kamehameha with lei, plus, of course, festival foods. Modern Hawaiian cuisine is a mix of various cultural influences including Polynesian, Asian, European, and North and South American. 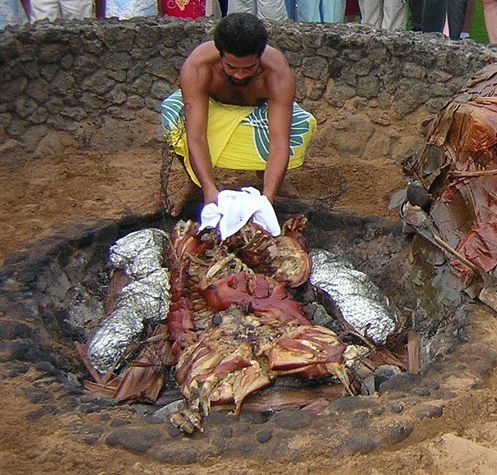 However, the classic festive dish of Hawaii is kalua pig, a whole animal roasted in a covered pit lined with hot volcanic rock (an imu). Most of us don’t usually have the time, space, or volcanic rock to accomplish this feat – not to mention the difficulty of rounding up 100 people to serve it to. This is not to say you can’t do it. I’ve not ever dug a pit, but I’ve certainly enjoyed spit roasting a whole pig on several occasions, and without doubt there is no comparison with other methods of cooking. But you can get reasonably close. Here is a recipe for oven roasted kalua pig adapted from Sam Choy. It should be served with baked sweet potatoes and poi (mashed taro root). You can get banana leaves at Asian or Latin markets, or substitute baking parchment. Cut ¼ inch (.6 cm) deep slits 1 inch (2.5 cm) apart all over the pork roast. Rub 2 tablespoons (30 g) sea salt all over the pork. Unfold a banana leaf on your work surface and place the pork roast on top of it. Fold up the leaf around the pork, enclosing it completely. Repeat wrapping the pork in the remaining 2 banana leaves. Tie the package with kitchen string to secure, then wrap the roast tightly in heavy foil. Double wrap if necessary to ensure that no steam can escape. Place the pork in a roasting pan and add 4 cups of water to the pan. Check periodically and add more boiling water if the pan starts to run dry. Roast the pork in the oven for 5 hours. Unwrap the pork carefully (there will be scalding steam inside), and cool slightly. Shred the pork by pulling it apart with two forks, and place the shreds in a large bowl. Bring 2 cups (4.8 dl) of water and 2 teaspoons (10 g) of sea salt to a boil in a small saucepan. Add the liquid smoke. Pour this mix over the pork and stir to blend.